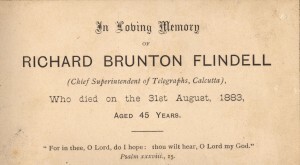 Richard Brunton was born in Birmingham February 18th 1838 and died in Calcutta, West Bengal August 31st 1883 from Melena – a severe gastrointestinal hemorrhage. He was named Brunton after his mother’s family. Richard and his sister Ann were baptised at St Martin’s Anglican Church, Birmingham on March 6th 1839. In their early teens, Richard and his brother James George were apprenticed to their father in the printing business in Birmingham. Although not confirmed, Richard and James probably continued to work with their father at The Bridgewater Times newspaper when the family moved to Somerset in 1851. 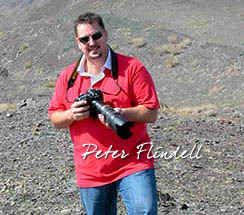 I am the son of Richard Brunton Flindell – born in Calcutta in 1863 Nov 28th. My father went out to the Crimea as a clerk to his father (my grandfather) Francis Bassett Shenstone Flindell – after the war, on his return to London my grandfather got my father indentured to the East India Coy as a Telegraph operator. Superficially this suggests they returned directly from the Crimea. However, the phrase “after the war” does not rule out service in India, where the British waged a constant battle for supremacy. By 1854 the East India Company telegraph communications system based on West Bengal was operational. By 1857 the Company was involved in the Indian Mutiny. It seems that Richard took passage with the rest of the family enroute to the Swan River Colony. The New Calcutta Directory for 1853 records Mr. Flindell arrived on October 5th 1858 on board the “Nile” from Portsmouth to Calcutta. See his record of service at the end. After the death of Charlotte, baby Francis was raised by his father and maternal grandparents in Calcutta. This must have been a worrying period and, no doubt, baby Francis would have been lavished with great care to ease the emotion of the loss of Charlotte and for fear of an infant loss. 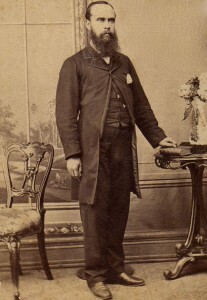 Richard arrived in Albany from Ceylon aboard the “Ceylon” on 5 December 1874. 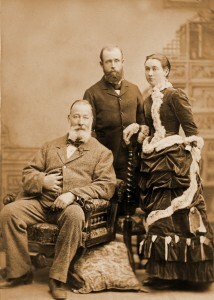 It is also known that Richard and Charlotte visited Western Australia from family photographs. Considering the dates of their marriage, the birth of their only child and the death of Charlotte, the visit was probably in 1863 possibly their honeymoon. It is possible Francis Richard was conceived either at sea or in Western Australia. JAMES MORRISON has received instructions from F. R. Flindell, Esq., to offer for sale by public auction, at the W. A. Land Exchange, Perth, on the above date at 4 p.m. sharp, that Comfortable And Valuable House And Premises, situate in Meadow Street, Guildford, lately tenanted by James Morrison, and now in the occupation of H.E. Parry, Esq., at an annual rent of £40 guineas. The House is of the bungalow type, with good Verandahs round three sides, and contains 8 rooms and hall. The kitchen and servants’ room are detached, and in the courtyard there is a 3-stalled stable, coach house, and lean-to shed. The garden and grounds contain some of the best-grown fruit trees in the district, comprising orange, true lemons, apricot, loquat, plum, mulberry, peach, olive, fig, and almond trees,- all of superior quality, and in healthy condition. There is also a good vineyard of muscatel raisin grapes, and a trellis of Wortley Hall, Sweet-water and Burgundy grapes. The soil is as good as any in Guildford, and the property as a whole may be described a rus in urbe, unequalled for quality, comfort, and completeness in the district. Title – Crown to the late Mr. R. B. Flindell, who bought it from the Government. For many years this property was the Official Residence of the Superintendent of Convicts for the Swan district, and is within four minutes walk of the Railway station. The property was passed in at the vendor’s bid of £350, and offered for sale at that price privately. Episcopal Records held by the British Library show Charlotte was buried in the General Episcopal or burial ground of Chowringee, while Richard was buried in General Episcopal Cemetery, Lower Circular Road, Calcutta. From my research these are one and the same. The cemetery still exists and a register of burials is held there, but the grounds are in a poor state of repair. 1883 – Superintendent of Telegraphs, Bengal, 11 Ballygunge Store Road. Superintendents 3rd Grade: R.B. Flindell, Dacca, promotion to present grade January 1st 1866, appointment to Government Telegraph Department October 3rd 1857, service on March 31st 1871: 13.6, salary Rs750. The Nile sailed from Plymouth. This was probably taken in Western Australia.